Officially Licensed Product - Available Now! Did you know? 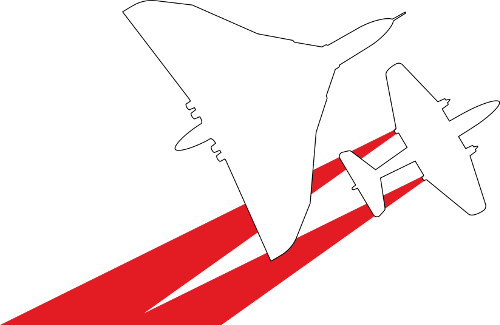 XH558 flew in RAF service for nearly 33 years of the Royal Air Force's 100 year history. This year the RAF celebrates the very special occasion of its 100th birthday on 1st April 2018 and will continue to celebrate the centenary through the year. To recognise 100 years of the RAF we are offering a series of 10 collector coins featuring some of the most loved and iconic aircraft from the history of the Royal Air Force, up to the present day. 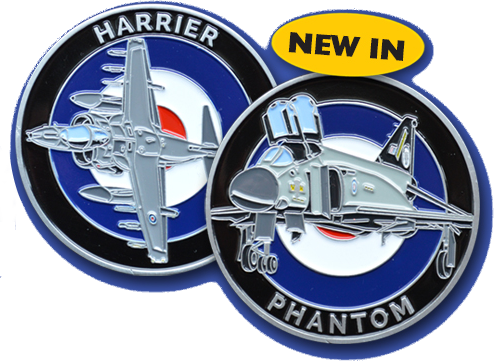 This coin features the world famous British built Harrier and the reverse shows the Phantom in 74 squadron markings. An aircraft flown by XH558 pilot, Kev Rumens, during his RAF career. On the obverse is a fully swept Tornado GR.4 at low level in the ‘Mach Loop,’ Wales. The reverse shows the Tornado in planform with its wings in unswept and swept configurations. 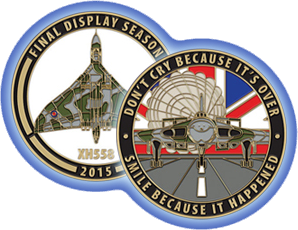 The face of the medal depicts XH558 in her familiar wrap-around camouflage scheme with a white enamel background and gold borders. On the reverse is a head on view of 558 on the runway, air brakes and braking parachute deployed with a union flag background, symbolising the final landing of “The Spirit of Great Britain’s” illustrious flying career. This coin celebrates the iconic V-force aircraft. 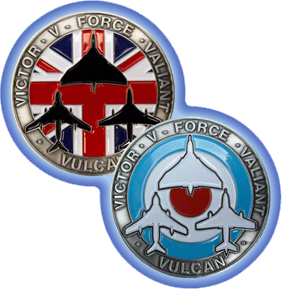 The obverse displays a black planform of each type overlaid on a Union Flag backdrop, surrounded by the name of each aircraft and their collective name of V-Force. The obverse of the first coin features an interpretation of a Yellowjacks patch should the team have carried on for longer than one season. We have incorporated areas of 3D detail in to the patch design to bring it to life. 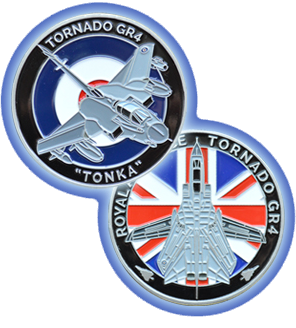 The reverse depicts the 4 Flying Training School (FTS) crest in 3D detail against the striking yellow that the five Gnat aircraft were painted in. The second coin depicts the Yellowjacks in formation against a blue sky, trailing white smoke once again using 3D relief. 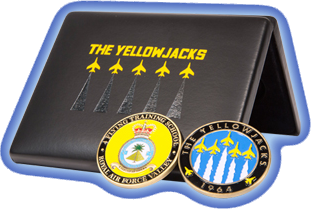 The Royal Air Force Valley station crest is shown on the reverse, this is where the Yellowjacks were based as all the pilots were instructors on the Gnat at the time. 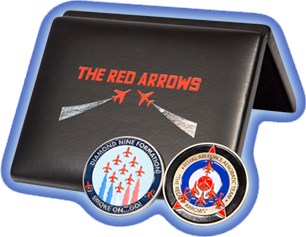 The obverse of the gnat coin features the patch worn by Red Arrows aircrew from the early years of the team in the 1960s until 1979, the last year of the Gnat. Incorporated are areas of 3D detail in the patch design to bring it to life. The reverse depicts one of the most famous images of the gnat at extremely low level in the countryside with smoke on, again in stunning 3D. The obverse of the Hawk coin features the iconic ‘Diamond Nine’ formation. Once again using 3D relief, the famous Diamond Nine formation is depicted trailing traditional red, white and blue smoke. The phrase heard across airshows worldwide, “Smoke on…Go!” is shown around the bottom of the outer rim. 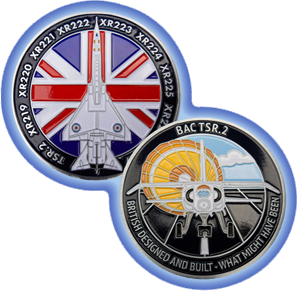 This coin celebrates the iconic aircraft with a planform overlaid on a Union Flag backdrop on the obverse, surrounded by the nine TSR2 registrations assigned to the first development batch of aircraft. 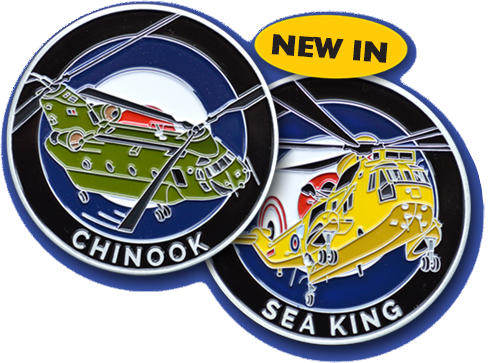 The reverse depicts XR219 landing (the only aircraft of the type to fly), then streaming her braking parachute – together with the wording ‘What might have been’.